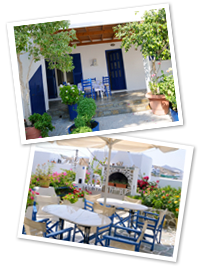 Pandora Holiday Accommodation is a charming little family-owned & operated pension set in a tranquil neighborhood area of Naoussa, in Paros Greece. A comfortable, classically Cycladic styled house offering rooms and apartments for rent near the center of Naoussa. The accommodation is set behind a colorful communal courtyard sitting area draped in bougainvillea, flowers, vines & herbs, ideal for relaxing in the shade. Pandora offers cozy rooms for 2-3 persons as well as studios and apartments for 2-4 persons, all with TV, refrigerators, balconies, WiFi and balconies, most with sea views, in a peaceful area — yet still all within just a short, pleasant walk of 500 meters to the center of Naoussa and its boutiques, cafes and wonderful restaurants and seaside tavernas. A truly pleasant place to enjoy warm Parian hospitality in quiet, clean and traditional surroundings in the seaside historic town of Naoussa.